If you’re considering Laser eye treatment, the most sophisticated and accurate method in the world today is LASIK Advanced Wavefront. Vision correction treatments have evolved significantly over the past decade. The techniques practiced years ago were nowhere near as accurate, pain free or with low risks of complications as they are today. This article explains how LASIK works and why it is the best laser eye treatment in the world. Here, we look in detail at the LASIK Advanced Wavefront procedure which is one of the most popular procedures performed at Advanced Vision Care’s modern Harley Street Clinic. What Is LASIK Advanced Wavefront? With IntraLase LASIK Advanced Wavefront at AVC, the process of reshaping the cornea to perfect your vision is conducted by a blade-free Laser. Additionally, LASIK Advanced Wavefront treatment employs sophisticated technology capable of capturing 3D measurements of the patient’s eye which helps our surgeons deliver more accurate treatments with impeccable results. With the cutting edge Wavefront technology used by Advanced Vision Care, the eye’s ability to focus light rays may be accurately measured. In turn, a highly detailed 3D map of your eye is constructed, which highlights any irregularities in the way images are processed. Crucially, the information obtained through this 3D map allows AVC surgeons to create a bespoke surgical plan for each patient. The end result is that the corneal irregularities that cause distorted vision are corrected with a precision that would be impossible without this cutting edge technology. It’s little wonder then that 100% of Advanced Vision Care patients achieve driving standard vision following LASIK Advanced Wavefront treatments. 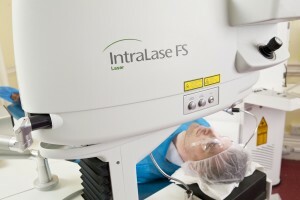 Why Patients Should Choose LASIK Advanced Wavefront? In a nutshell, LASIK Advanced Wavefront is a ground breaking treatment on multiple fronts. Successful treatment not only enhances visual acuity, but visual detail too. Patients can enjoy far greater contrast sensitivity which manifests in finer detail and contrast sensitivity. Using Advanced Wavefront also significantly improves the chances of the patient achieving 20/20 vision or better. Finally, utilising Advanced Wavefront LASIK significantly reduces the possibility of post-op complications like halos, glares or troubled night vision. These are also known as higher-order aberrations and, prior to the emergence of Advanced Wavefront technology, these conditions were not uncommon following surgery with older LASIK techniques. Fortunately, today, when patients do their research and choose a clinic which offers the finest technology and surgeons, such complications are extremely rare. Wavefront is used to project a ray of light into the eye, which is subsequently reflected back off the retina, and returns out via the pupil. The ray then returns to the Wavefront machine, which decodes the returning light to find the patient’s lower and higher-order aberrations. Wavefront technology is capable of highlighting optical irregularities by way of a 3D Wavefront map. Crucially, this data is subsequently transferred into the LASIK Laser which allows for highly customised treatment plans and ultimately the most flawless results possible. Interested in LASIK Laser Eye Surgery? Ready for the best vision correction money can buy? Talk to one of our experts on 020 7935 7497 or email at info@advancedvisioncare.co.uk to discuss your options.